We began this week's show with the announcement from WXOX Station Manager Sharon Scott and outgoing LVA Outreach Director Ehren Reed that this design by Wilfred Seig III won the selection for a mural on WXOX's east facing wall! Seig will begin the mural soon, and expects to be finished by the end of August. Then incoming LVA Outreach Program Manager Katy Delahanty, Portland studio artist, and board member for the Portland Museum, joined us to talk about her new job with LVA, why the Portland neighborhood is important to the city. She was joined by fellow Portland artist Bryan K. Holden to discuss The Future Is Now mentorship program that is a collaboration with LVA and KyCAD. he was paired with Ballard HS student Marc Nadmid, who was also in the studio with us. The Future Is Now exhibit of opens Friday, July 27 and runs through August 7 at KyCAD's 849 Gallery, with a reception July 27 from 5-7pm. Tune in WXOX 97.1 FM/Artxfm.com every Thursday at 10:00am for the live broadcast of LVA's Artebella On The Radio. Louisville Visual Art is a recipient of a Jennifer Lawrence Foundation Fund for the Arts Imagine 2020 grant! 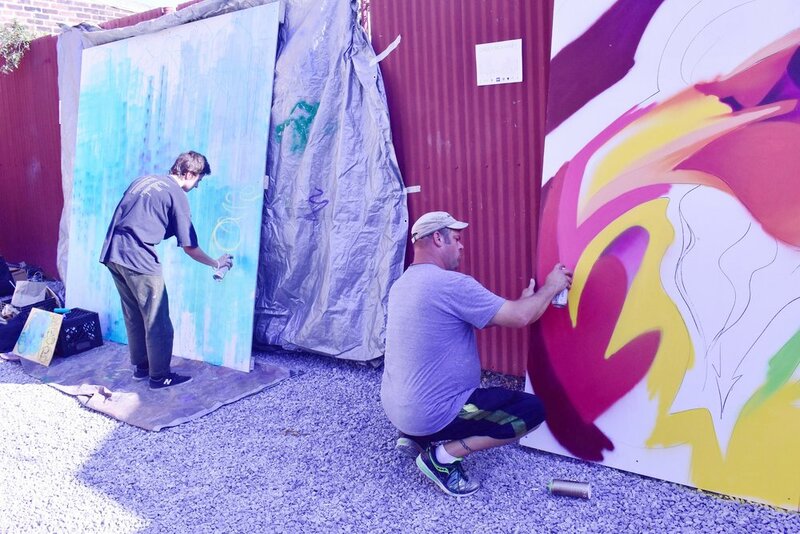 "Taking Art in a New Direction" - In partnership with New Directions Housing Corporation, LVA will expand its existing Mural Art Program and target locations throughout Louisville's West End to develop a vibrant mural network. LVA is grateful to the Jennifer Lawrence Arts Fund at the Fund for the Arts, Louisville Metro Government and Imagine Greater Louisville 2020. We are thrilled to partner with New Directions on this initiative in West Louisville! We were honored to witness the unveiling of the Veterans for Peace mural at Indiana University Southeast in New Albany, IN, honoring those who have served or are currently serving in our military. 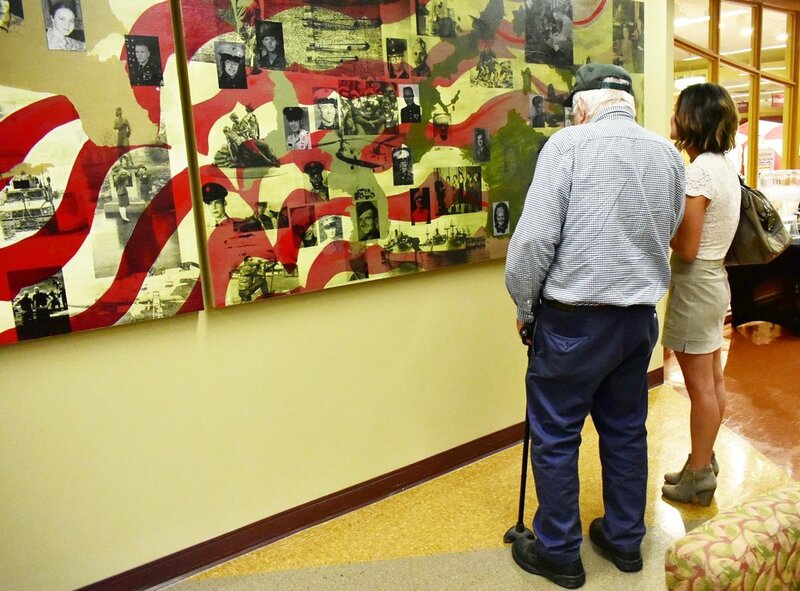 Printmaker and IUS Assistant Professor of Fine Arts Susanna Crum and Mariana Grohowski, Assistant Professor of English, led student and local veterans in creating the mural, and LVA was proud to do what we could to help make it happen. We thank our partners who made this possible, ArtsMatch and the Jennifer Lawrence Arts Fund at the Fund for the Arts, and Center for Neighborhoods, for their continued support, and Veterans for Peace for all that they do. 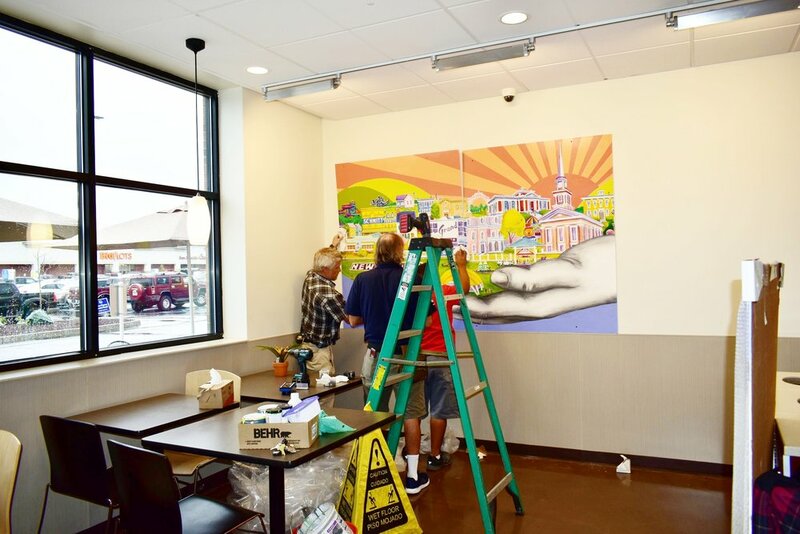 Our newest Kroger mural by artist Liz Richter was installed in the New Albany Kroger on State Street this week! It's filled with gorgeous color, interesting characters (including the band Houndmouth - see if you can find them!) and fascinating history. 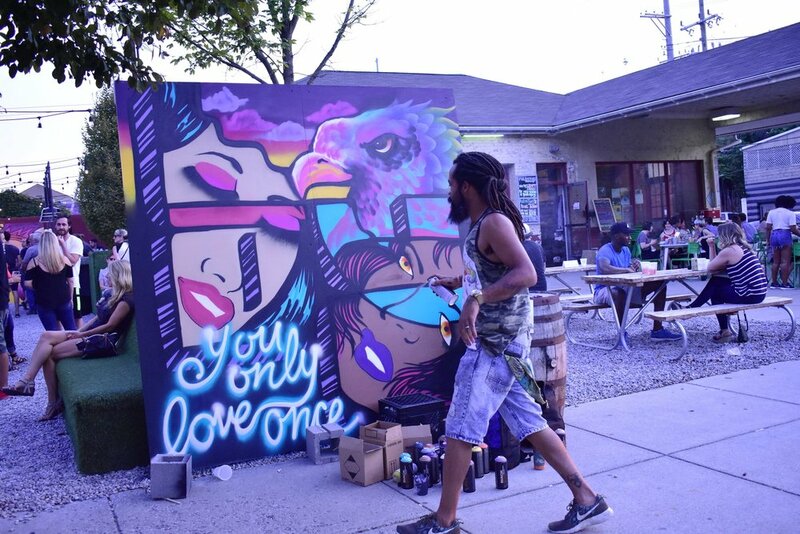 "MAPped Out," a live-painting event benefitting LVA's Mural Art Program (MAP), was held at Garage Bar on Friday, August 18 from 5pm-10pm. 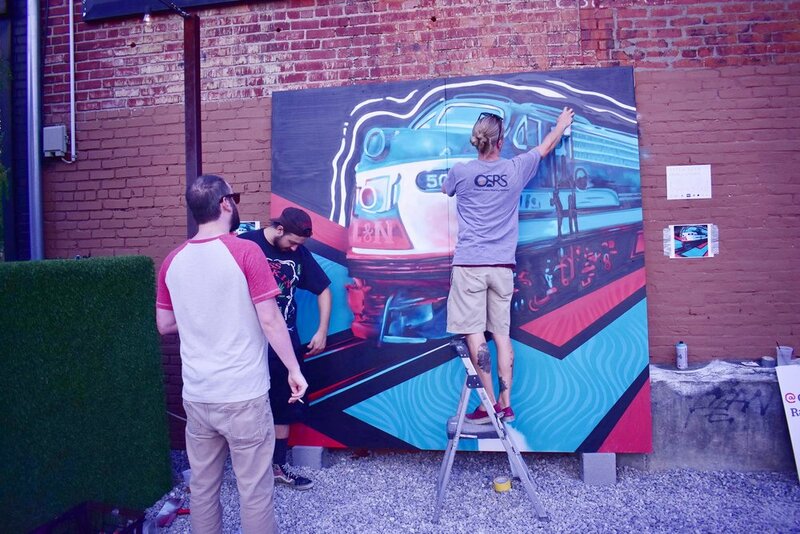 Several of Louisville's best artists created mini-murals for a silent auction, serving as a unique and exciting focus for a night filled with music, drink specials and art, art and more art. We had such a wonderful time at MAPPED Out! A huge thank you to Ashley Brossart, Alyx McClain, Braylyn Resko Stewart, Karl Otto, Liz Richter, Pat Sheehan, Vinnie Kochert for creating amazing mini-murals for our silent auction— nearly $5,000 was raised for the Mural Art Program! We also couldn't have done it without our generous sponsors— Garage Bar, Revelry Boutique Gallery, Via Studio, West Sixth Brewing, Tito's Vodka, and of course our wonderful partner Center For Neighborhoods. Thanks to all of you who came out and made the evening so successful— it was so humbling to hear you are as excited as we are about MAP!